You can harvest corn seed if you have planted non-hybrid corn for the current growing season. While hybrid seeds produce a higher quality crop, they have been bred in a lab to do so. Because of this, if you save hybrid seeds, the corn you get next year may look nothing like the ear of corn you harvested your seed from. If you do not know if your corn is hybrid or non-hybrid, check the package or consult the market where you purchased your seed. Otherwise, start by planting non-hybrid corn this year, and save your seed for next year's crop. Harvesting your own seed saves money and allows you to pass down heirloom seeds from generation to generation. Examine the ears of corn on the stalks and note which ears appear to be the healthiest. Select one or two of your best ears to save for seed. The number of ears you save will depend on how much corn you wish to plant next year. If you have a small home garden, one ear may be enough. Leave the selected ear on the stalk to dry out when you pick the other ears for eating. The ear may remain on the stalk for another four to six weeks. If you have a short growing season, or there is a hard frost coming to your area, go ahead and pick the ear. Pick the seed ears when the husks turn brown. This can be up to six weeks after the other ears were harvested. Take hold of the cob and twist it until it pulls off the stalk. Since it is dry, it should pull off quickly. Pull the husks back away from the corn cob, but don't rip them off the ear. Instead, take a piece of string and tie it around the pulled back husks to keep the corn kernels exposed. Hang the cob up in a dry area, where squirrels and rodents will not be able to get to it. To hang it, simply hook the string that is around the husks over a nail. Allow the corn to hang dry for three months. Take the ear of corn down from its hanging position after three months. To test for dryness, pop one kernel off the ear and place it on a hard surface. Hit the kernel with a hammer. If it shatters, the kernels are dry enough to put away as seed. If the kernel does not shatter, the ear of corn needs to hang longer. Test again for dryness in three weeks. Remove the dried kernels from the cob by rubbing two cobs together, or by twisting the ear with the palms of your hands until the kernels pop off. Do this over a large paper bag, or a window screen that is lying on a flat surface. Remove any debris from among the kernels. Transfer the kernels to a glass or metal container, and store in a cool area. 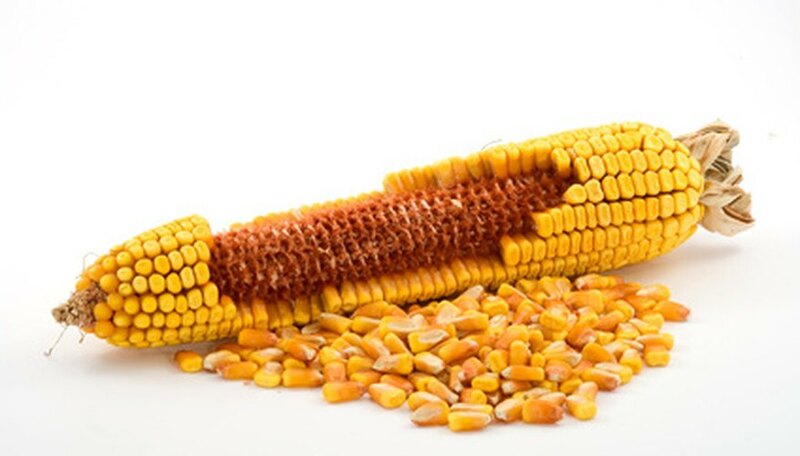 Corn seed can be stored for up to five years, as long as the kernels are completely dry. Do not use plastic to store your corn seed, as rodents will easily chew through it.